Spring Break Fishing Galveston Bay! We are all geared up and ready for the season. 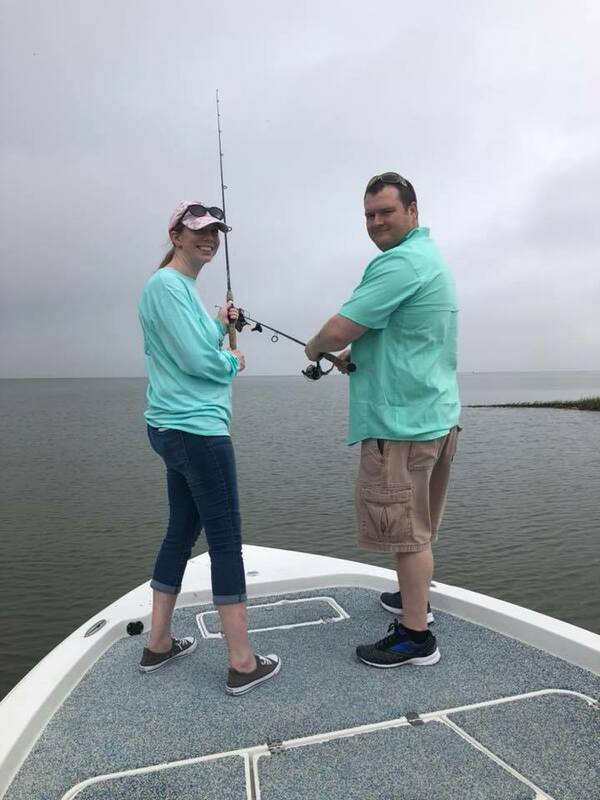 I have such amazing clients that I get to fish with every year, but I also look forward to meeting new people and creating memories on the water. Fresh for 2019, I had a new boat built 100% custom to my specifications. It is my utmost priority to ensure my customers get the best experience and have the best opportunity at catching fish with em. The time aboard whether 4 or 8 hours is short, so I want to exceed your expectations! The new boat is going to blow your mind and do everything we have been doing and more! I can’t wait for you to jump on board and experience it. Give me a call to book your adventure and let’s get out on the bay. The trout and redfish are coming out of the drains and marshes. And guess what, we are ready for them! Being stealthy and having the right presentation has been key for my anglers. Once you get the bite, hold one because these fish are going to be big! There have been some really fat trout around as well and it’s only going to get better. I stil have dates available here in April and starting to book our May and June Season. I recommend you call me as soon as you have your dates, so you can get in the calendar. 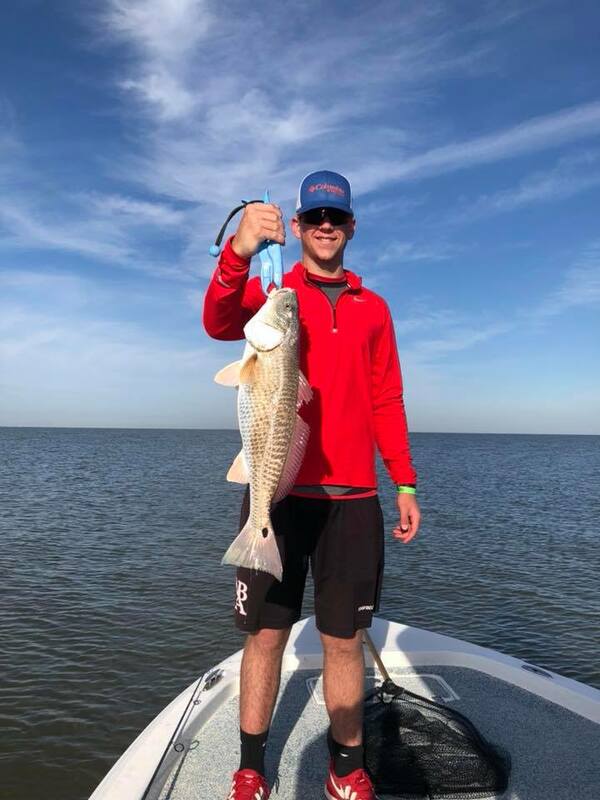 Spring Fishing In Galveston Is Starting Off Great! I have been fishing everyday this year so far Galveston Bay. The weather has really cooperated, so I expect the Spring to be no exception. A few days we have had some tough winds and tides, but we still manage to have fun by ducking from the winds into calmer waters and keeping the optimism. 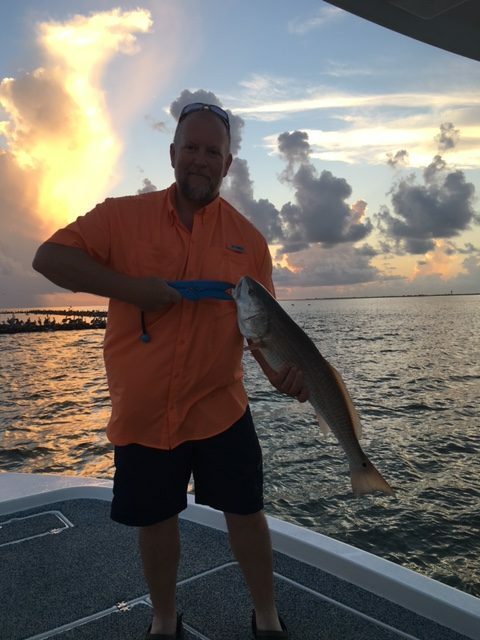 Check out this nice redfish we got we got this week. As we get into April, the fishing will begin to heat up as well. Looking for trout and redfish as our main target species. Using live bait and jigs has been working best. By fishing everyday, I have had a huge advantage over the rest of the fleet. Keeping log books helps as well to identify patterns for the time of the year. Even when the conditions are not ideal such as extremely low tides, I am able to refer to my journal to see how we found the fish under the same or near identical conditions. And by fishing everyday, I usually know what to expect although each day is different. This means more time for you to catch fish! One thing that remains consistent is that I get to fish with the best people in the world! Everyday I get to meet new and amazing people from all over the country. It is always a pleasure meeting new people as well as fishing with my repeat customers. And although fishing with adults is always great, fishing with kids is even better. 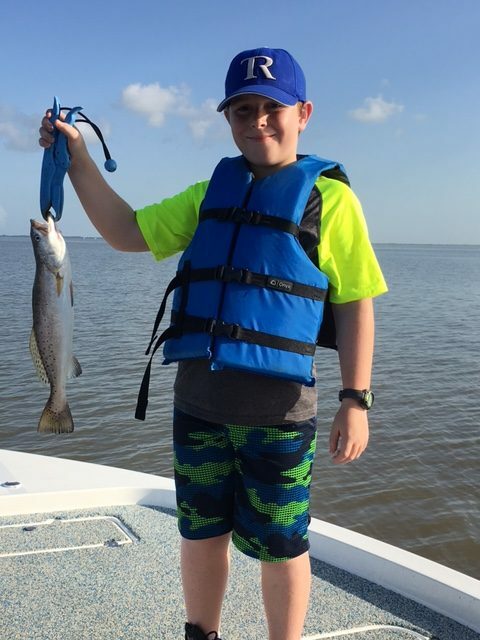 While providing a safe and fun fishing adventure, I always try to provide proper education while on board including the small things such as tying knots, how to bait a hook, boating safety, proper release of fish, etc. Having young children of my own allows me to really enjoy introducing new junior anglers to the love of fishing. Just check out that smile on her face! 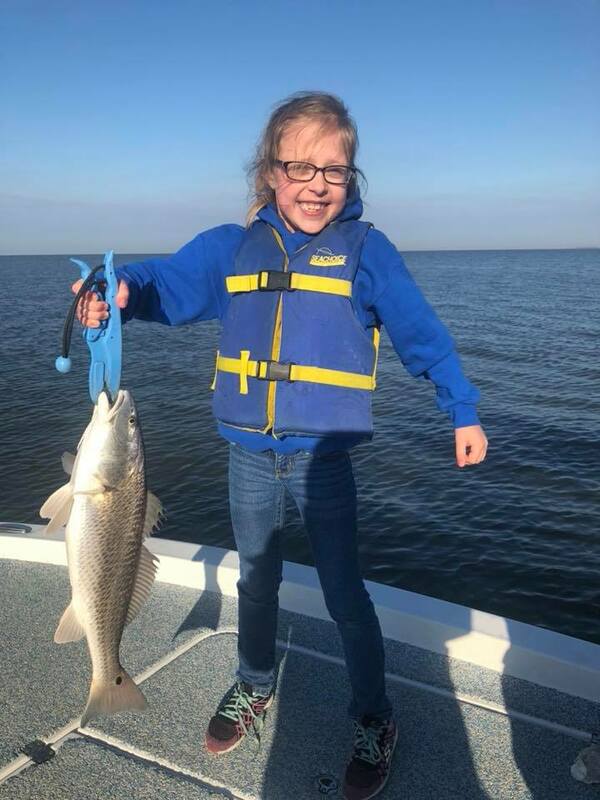 Way to go on her first redfish and a good one at that! As I get ready to run the afternoon trip today, we are still in full swing of Spring Break In Galveston Texas. One of the best things to do for spring breakers is go fishing! I have had some great trips with Parents and their children this past week and we look forward to the rest of the week. 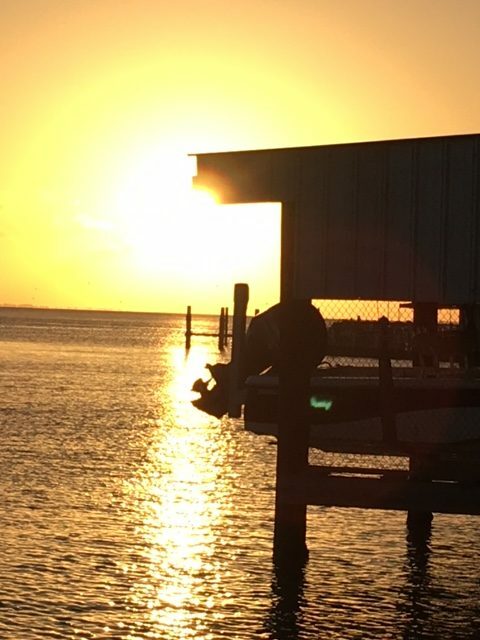 If you thinking of fishing here in Galveston Bay, I recommend you call me as soon as you know your dates. We fill up fast and it is best to get in the calendar as soon as possible especially if you need a weekend. I look forward to fishing with you and Tight Lines! 78 Degrees In Late November?! What a great year of fishing we are having and we have to thank the weather gods as we haven’t seen a sign of winter yet. As I type this the temperatures are a perfect 75 degrees here in Galveston Texas. We are on the water daily chasing redfish and trout using artificial and live bait. Watching the tides has been key as well as an early morning start to find the fish. 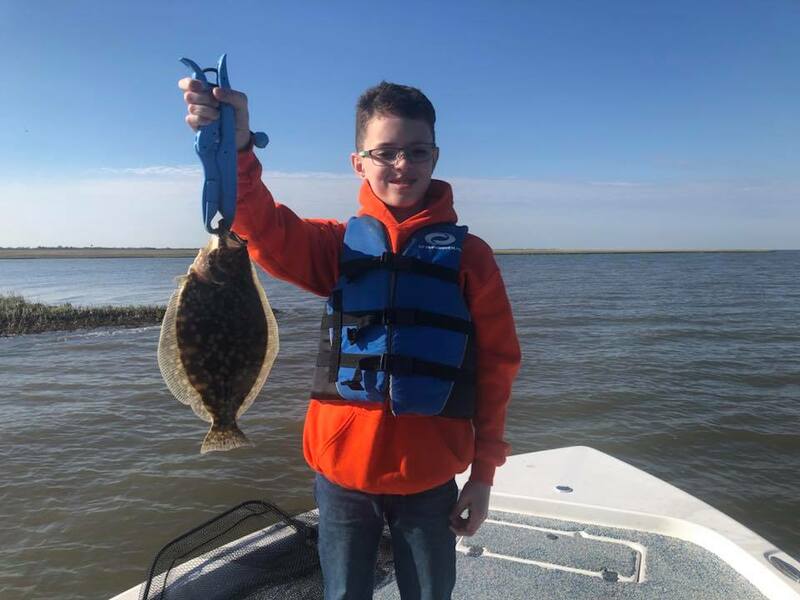 This past week had a several groups of junior anglers. 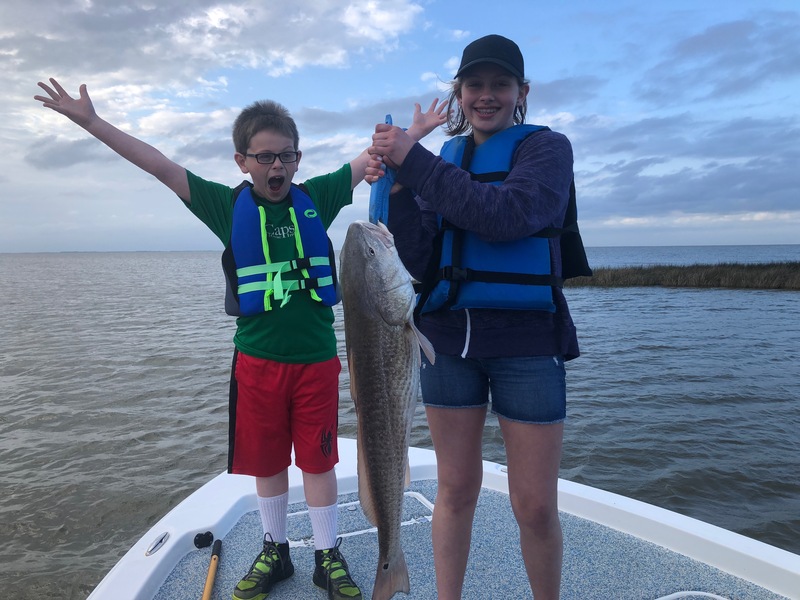 Fishing with children of all ages is a passion for us as we get introduce them to fishing as well as work with experienced children to get them on their “PB” personal best fish. As we get into December, I’m thinking the temperatures got to drop a little right? Either way, we will be out there everyday and adjusting our techniques according to what mother nature gives us. 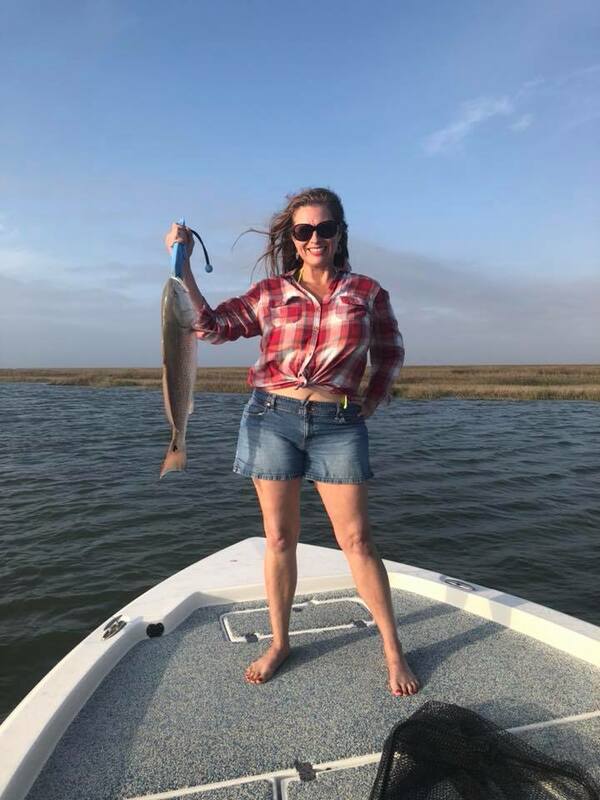 If you are looking to go fishing during the holidays I still have some dates open and we also have gift certificates which make great stocking stuffers. We survived our winter, or should I say lack of winter. We actually fished all winter long with very few really cold days, but the fish didn’t seem to mind. 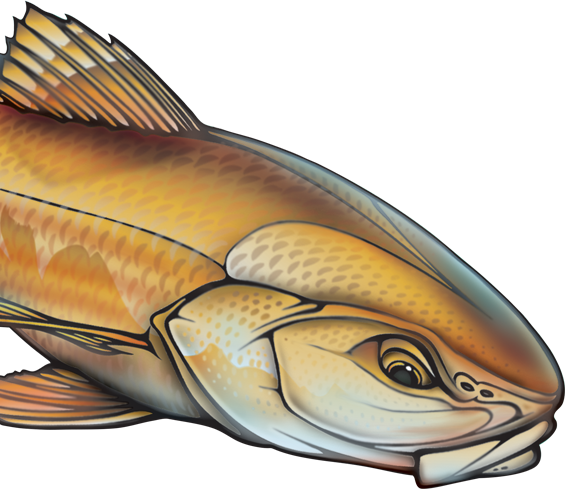 With April just a few days away, we are gearing up for the Spring transition of bait and game fish. 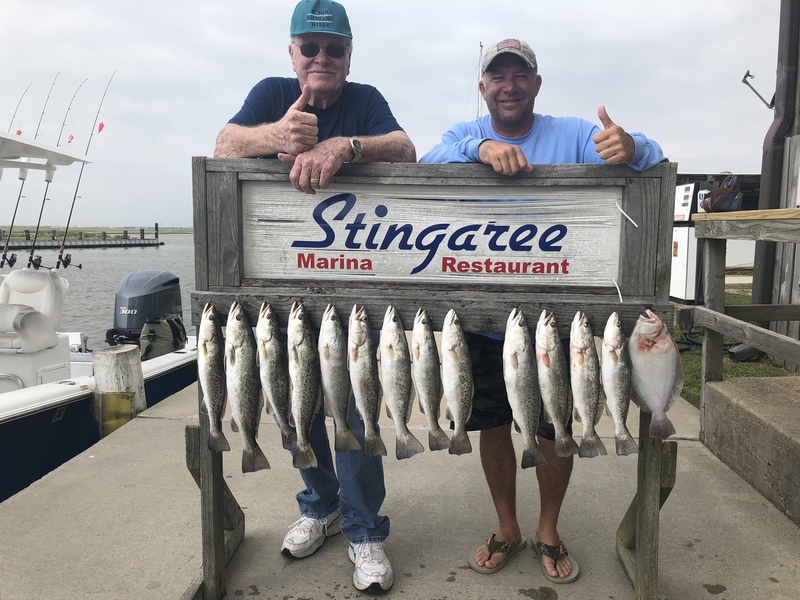 As the temperatures rise, the fishing will continue to get better and better. The tides will be determining where and what we are fishing for. In the past couple weeks I have had some great clients including many junior anglers that I had the opportunity to introduce to fishing. As a father it is pure joy when I get the chance to teach other children how to fish and see the smile on their face when the rod bends over for the first time. Even better is when I get a family and there is a little bit of a competition on my boat to see who can catch the biggest fish. What a hoot! 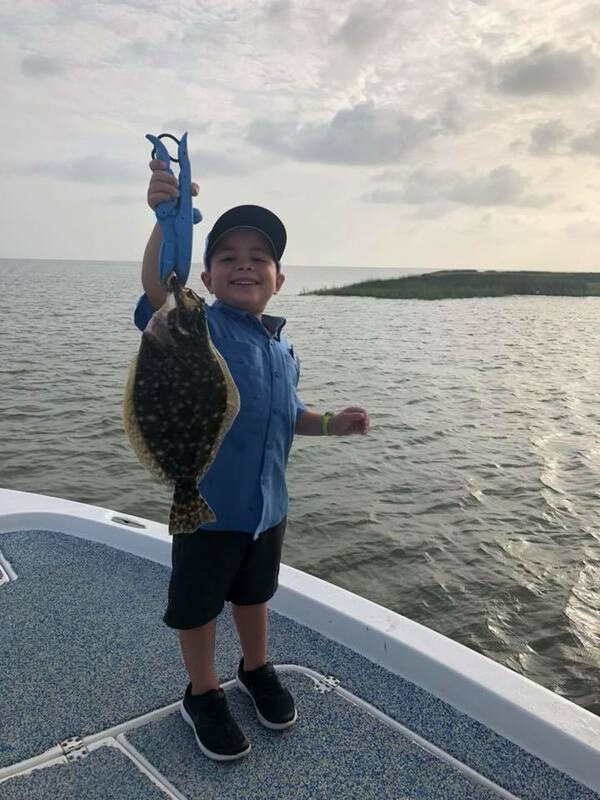 All my charters are kid friendly for all ages and it is my absolutely priority to provide a safe and fun fishing trip no matter what the level of experience is. Life jackets are available and I always make sure the deck is clean and free of any gear. I am extremely patient and not your typical ‘grumpy’ captain. I am very passionate about fishing everyday and meeting new clients. 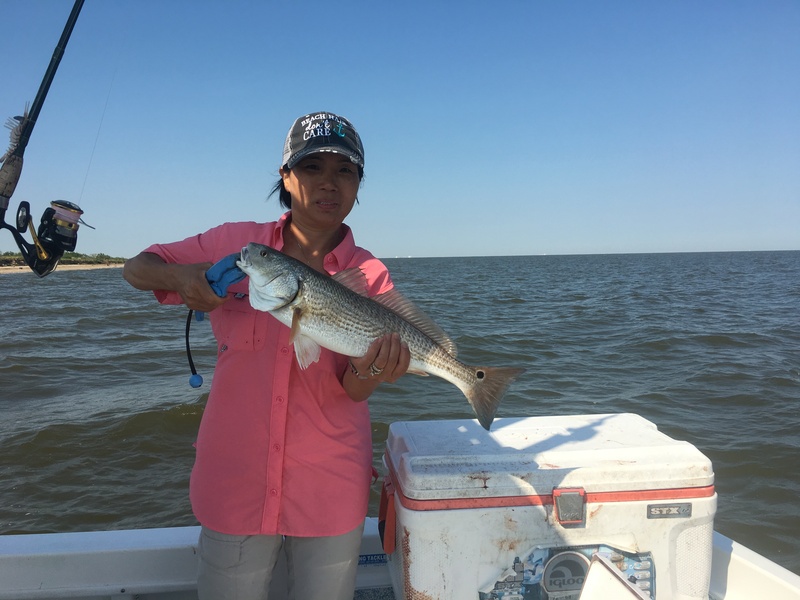 If you are looking to catch redfish or trout, now is your time to start booking. The redfish are in my secret spots and the trout are spread out. I recommend you book a full day so that we can try different areas and methods if you have the time. That’s the report from Galveston Bay for now. If you would like to book a trip, please call or shoot me an email. I’m on the water daily, but I’ll return your call very fast if I happen to be hooked up to a fish and miss it.